The “bories” are smalls homes with igloo forms, completely made with “dry stones”. Their origin go up to age of bronze. The more recent where builds in XVIII siecle, development period of the agriculture, imposing to take the stones of the poor grounds of the limestone’s plates, to allow the setting in culture it. The “Village of Bories”, classed as un historic building, constitute the most important grouping of this stone homes. 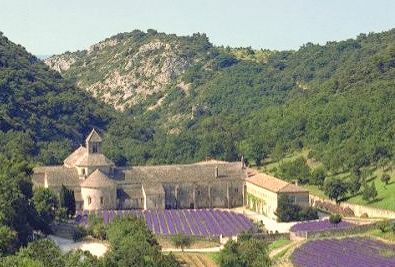 The bories are characteristics of the region of Apt, and their stronger concentration is on the territory of Gordes.This village is situated on the Mounts of Vaucluse, near the Luberon. At the time of the visit, one can admire his sheep-folds, its furnaces for bread, tanks for wine, surfaces to beat the cereals, smalls streets, enclosing walls, who let imagine the activities and the work of many peoples which lived there. After an abandonment of more than a hundred years, it was carefully rebuilt. It is now protected, but opened with the visitors. It is a memorial of rural settlement which shelters a collection of objects and traditional tools of the region. One finds there also documents on the passed of Gordes, on the bories and their architecture. The see of the village of Bories in the lights of the morning east, leaves a single impression of harmony between the vegetal and stones like a return in the origins. 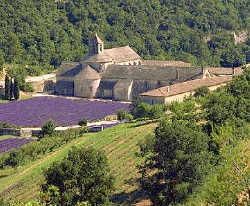 In a green small valley, there is also the abbey of Sénanque, where lives since the 12 eme siecle a community of Cistercians monks. One can visit his abbatial church, cloister, dormitory and chapter room. Pilgrims comes still to pass there a period of meditation, while sharing the monks life.